The global tyrosine kinase inhibitors market was valued at US$ 18.3 Bn in 2017. It is projected to expand at a compound annual growth rate (CAGR) of 0.02% from 2018 to 2026, according to a new report published by Transparency Market Research (TMR) titled “Tyrosine Kinase Inhibitors Market Global Industry Analysis, Size, Share, Growth, Trends, and Forecast, 2018–2026”. 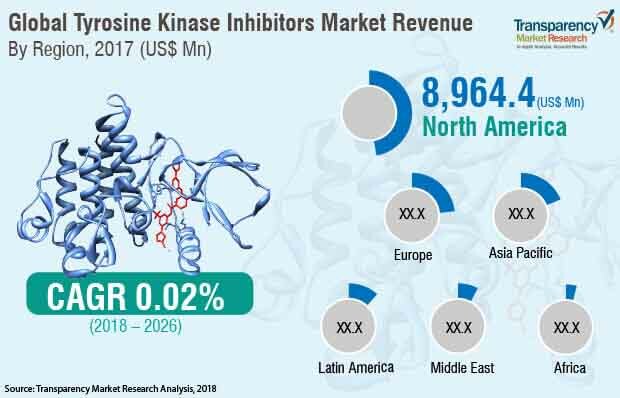 The report suggests that rising awareness about cancer diagnosis and treatment and expanding indications of existing & pipeline TKIs are expected to boost the tyrosine kinase inhibitors market in the near future. North America and Europe are projected to dominate the global market owing to high prevalence and increase in incidence of cancer and the high rate of norms for drug import initiatives to attract healthcare providers and pharmaceutical companies in order to establish their base and drug pricing regulations, which are likely to drive growth of oncology market. This, in turn, is augmenting the tyrosine kinase inhibitors market in North America and Europe. The market in Asia Pacific is projected to witness expansion at a significant growth rate during the forecast period. Expansion of the market in Asia Pacific is attributed to high prevalence and increase in incidence rate of cancer and rise in health care expenditure in Asia Pacific. The market for tyrosine kinase inhibitors in Latin America is likely to expand at a moderate growth rate during the forecast period. The global tyrosine kinase inhibitors market is projected to be potentially driven by the high prevalence and increase in incidence of cancer across the globe. Moreover, tyrosine kinase inhibitors were accepted largely due to specificity and efficacy and benefits over chemotherapy and radiotherapy. For instance, BCR-ABL TKIs, which were earlier approved for treating CML, are not indicated for treating acute lymphoblastic leukemia (ALL) and gastrointestinal tumors. Similarly, EGFR TKIs are approved for an array of indications such as pancreatic cancer, breast cancer, and non-small cell lung cancer. Tyrosine kinase inhibitors manufacturing companies provide diverse features and benefits to cancer patients, from chemotherapy and radiotherapy treatment procedures, which can be utilized by physicians to treat cancer patients. Key players and researchers have invested to develop new and advanced tyrosine kinase inhibitors with less toxicity and adverse effects. Researchers are applying various approaches to tackle this issue such as modification of molecular structure and use of excipient. This is likely to introduce a new class of TKIs that offer better efficacy and safety. Companies are focusing on the development of tyrosine kinase inhibitors therapy by multi-targeting feature. Multi-kinase targeting TKIs offer better drug stability and patient acceptance such as Sorafenib (Nexavar), Cabozantinib (Cometriq), Axitinib (Inlyta) and under development TKIs such as TSU-68, Brivanib, and Cediranib (Recentin) are likely to augment the product life cycle and widen the application areas during the next few years. Lung cancer is the leading cause of death in the world. An estimated 1.8 million new cases of lung cancer are reported each year across the world. TKIs are preferred to treat non-small cell lung cancer, which accounts for 85% of the total lung cancer cases. Increase in incidence of lung cancer and introduction of new tyrosine kinase inhibitors for the treatment of non-small-cell lung carcinoma is likely to propel the segment during the forecast period. In terms of distribution channel, the independent pharmacies segment accounted for a leading share of the global tyrosine kinase inhibitors market. It is estimated to gain market share by the end of 2026, expanding at a CAGR more than 0.20% during the forecast period. Wide network of independent pharmacies and expansion of international pharmacy service providers across the global are likely to propel the independent pharmacies segment in the global tyrosine kinase inhibitors market. Online pharmacies offer convenience and discounts, which is likely to attract new customers. Moreover, increase in adoption of e-commerce is likely to augment the segment. However, concerns about counterfeit medicines, medication, and delivery errors are likely to hamper the segment between 2018 and 2026. North America and Europe accounted for a key share of the global tyrosine kinase inhibitors market in 2017. These are likely to saturate in market share by the end of 2026. High prevalence of cancer, increase in health care expenditure in countries in Eastern and Central Asia Pacific countries, and government initiatives to promote the usage of tyrosine kinase inhibitors in therapy have contributed to the leading share held by these regions in the global tyrosine kinase inhibitors market. Asia Pacific is projected to be a highly attractive market for tyrosine kinase inhibitors, and is likely to exhibit a considerably high attractiveness index during the forecast period. The market in Asia Pacific is projected to expand at a high CAGR of more than 0.14% during the forecast period due to the rise in incidences of lungs cancer in emerging countries such as India and China. Furthermore, well-established healthcare facilities, and high adoption of digital healthcare technology in countries such as Japan, Australia & New Zealand, Malaysia, and Singapore are likely to fuel the market in Asia Pacific. The market in Latin America is anticipated to expand at a moderate growth rate during the forecast period. The report also provide profiles of leading players operating in the global tyrosine kinase inhibitors market. Novartis AG, Bristol-Myers Squibb Company, Pfizer Inc., and Johnson & Johnson are some of the leading players operating in the global tyrosine kinase inhibitors market and account for a significant market share. Companies operating in the tyrosine kinase inhibitors industry are focusing on increasing their geographic presence by means of strategic acquisitions and collaborations with leading players & increasing FDA approvals of therapeutic drugs in their respective domains and geographies. In February 2018, U.S., EU and Japan Health authorities accept regulatory submissions for review of Pfizer's third-generation ALK Inhibitor Lorlatinib. Other prominent players operating in the global tyrosine kinase inhibitors include AstraZeneca Plc, Bayer AG, Boehringer Ingelheim International GmbH, F. Hoffmann-La Roche Ltd., Eisai Co., Ltd., and Eurofarma Laboratórios S/A.